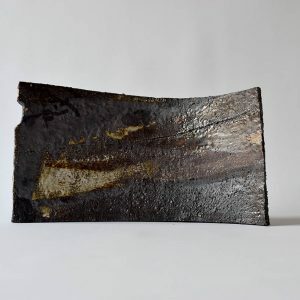 Kirsty Macrae is a ceramic artist working from my studio in North London. 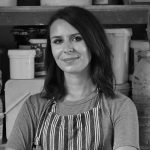 Her work is inspired by the rich heritage of seventeenth century English slipware pottery, using it as a starting point to inform her own contemporary sculptural ceramics. 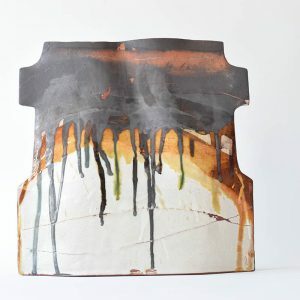 She creates work which distorts traditional pottery into abstract sculpture. The forms reference seventeenth century slipware vessels which were used to drink alcoholic drinks such as “bragget”, a concoction of fermented ale, honey and spices. She explodes the form, scale and decoration of these vessels to produce a contemporary take on this handmade slipware. Kirsty’s sculptural language is informed by her background as a painter, and occupies a space somewhere in between two and three dimensions. Her sculptures are built up very slowly and carefully using coils of red earthenware clay which is first bisque fired to 1000 degrees and then glaze fired to 1100 degrees. They are decorated using a palette of handmade slips and glazes, the recipes of which are very similar to those that would have been used by early slipware potters. The application of decoration utilises not only classic pottery techniques such as slip trailing, but also action painting and broad expressive mark-making to create lush, layered surfaces. 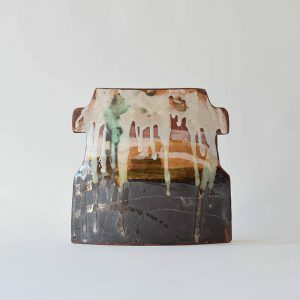 She is constantly fascinated by the interactions between the slips and glazes and experimenting to make new combinations. Kirsty graduated from The Glasgow School of Art in 2009 with a BA(Hons) in Fine Art: Painting & Printmaking.